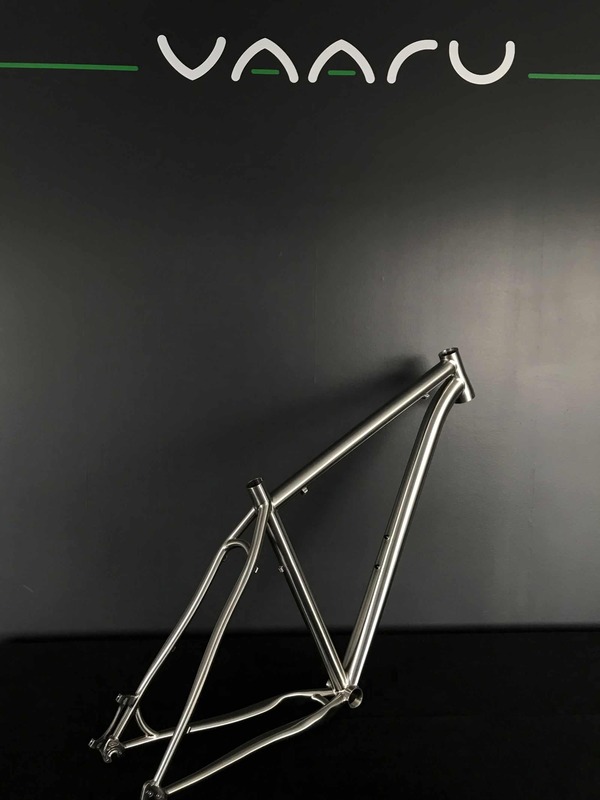 The V:29 titanium frame has been designed with racing geometry, fast responsive steering and offset for 100mm forks. The increased wheel diameter and shallow angle of curve makes it an endurance rider’s dream, rolling over bumpy terrain effortlessly. 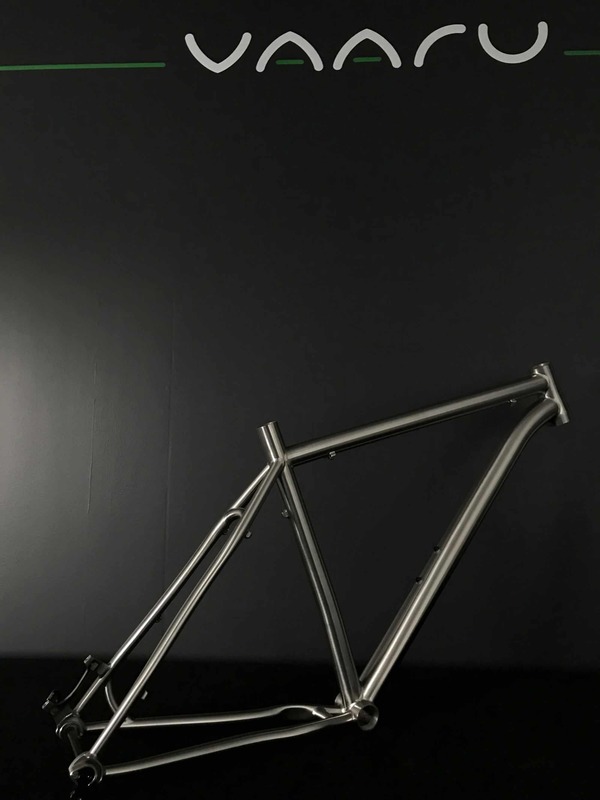 Every tube on the V:29 has been hand crafted and formed, the 3AL 2.5V titanium is double butted and makes this frame as light as possible but with maximum strength. VAARU details are found throughout the frame; 5 axis CNC’d logos on the headtube and forged dropouts, titanium welded bottle bosses, post style disc brake mount and double butted tubing throughout. The V:29 is available as frame only and comes with complimentary U.K. shipping. Please see the tabs below for the geometry and our customers’ reviews. 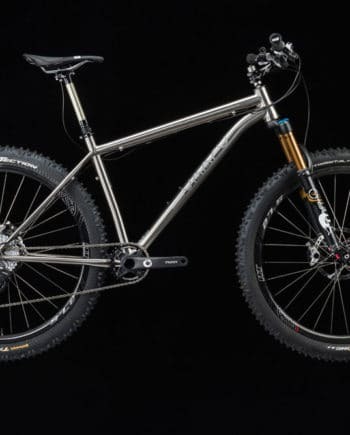 29er Frame Size Choose an option17"19"
VAARU Cycles V:29 Titanium Mountain Bike. Material: 3Al/2.5V (3% Aluminium, 2.5% Vanadium and 94.5% titanium) is mainly used for aerospace applications, this alloy is known for its strength, resistance to corrosion and ultimate ride quality. Tapered Headtube – Unlike other straight through 44mm headtubes which use much bigger bearings at the top, the VAARU headtube has been turned down from a much larger piece of titanium so it can taper in at the top. The result is a much more flowing design, the larger diameter tubing used on the down tube and the smaller diameter on the toptube merge into the tapered headtube perfectly. Weight saving has been maximized by taking the wall thickness down to a minimum. It also accepts a drop in headset which gives the user ease of servicing and replacement. The final touch is the 5 axis CNC’d VAARU logo, a proud touch to show the sign of quality and effort in producing every VAARU frame. Double Butted Tubing: Double butted tubing has been used throughout. The benefit of butted tubing allows the frame to have a thicker wall section in areas where increased stiffness is required whilst having a much thinner wall section in areas of low stress. This allows the designer to make the overall frame weight less than that of straight gauge tubing and also able to add different ride qualities by changing the tube profiles. Formed Seatstays & Chainstays: Both the seatstays and chainstays have been 3D formed to give a compliant ride, soaking up lateral shocks and small vibrations whilst remaing stiff when under the stresses of a rider putting maximum watts though the pedals when sprinting. Forged dropouts: The VAARU dropouts on the V:29 have been forged and post machined to give a low overall weight, a CNC’d VAARU Logo adds a touch of detailed quality. English threaded Bottom Bracket – With an overall low system weight when using a 24m axle, the threaded bottom bracket has been used, less material, less weight and stiff enough for the most demanding riding. Could not have wished for a better hard tail MTB. The big wheels and light frame work perfectly for riding where I do in Hampshire and West Sussex. The bike is fast on the up’s, and wonderfully fun and controlled on the down’s. I built the bike with weight in mind, and have managed to keep the overall weight including pedals to about 10Kg. I have had it for about one year now, and still have a massive smile on my face at the bottom of each hill. I was fortunate enough to be able to demo the V:29 Ti frame at the recent QE Cycle Fest 2015. I come from a background of riding mainly steel frames (853 reynolds) MTB in all flavours, geared, single speed, front fork, rigid etc. In more recent years I made the switch to riding full suspension trail bikes so it was great to get a leg over a hardtail again! For my demo ride on the V:29 I took it around the QE Park Red Trail which I know like the back of my hand (it’s my local haunt). The first climb I had many thoughts whirling around inside my head. Mainly this thing is so beautiful I shouldn’t be riding it but instead hanging it in my lounge as wall art. 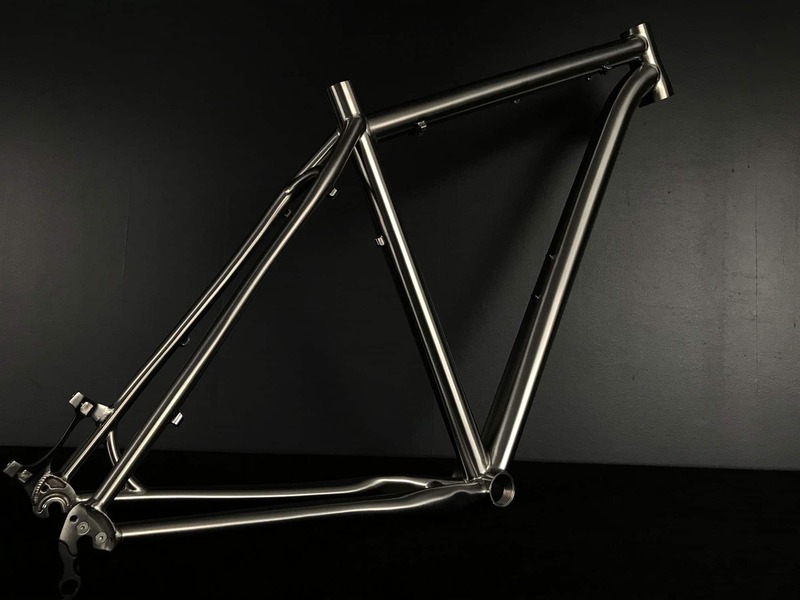 Honestly, take a look at this frame, the curves, the welds – it’s simply stunning! After getting to the top of the first climb my first impressions was how well it climbed, little to no effort – I like it! My next question to answer in my head was do I ride this around the rest of the trail like I would drive a Rolls Royce (if I owned one), or do I ride it like I did with my previous hardtail bikes, choosing the smoothest line. I decided none of those but instead riding it fast and taking the same lines I do with my full suspension bike. I was blown away with the outcome, I was expecting a real fight on my hands with some of my line choices but the frame just soaked up the bumps and all I had to do was point it in the right direction! OK, so it’s not as quick as a full suspension on some of the segments on the trail but it wasn’t far off and it was a heck of a lot more fun! At the end of the day, that’s why we ride for the fun / smile factor. Would I buy one, yes if my wife lets me. In fact if I had the money I would buy two, one for riding and the other for my lounge wall. I was lucky to demo this bike at the hargroves demo weekend at the queen Elizabeth country park. I loved the clean simple lines of the frame and the amount of detail in the finishing put some major companies to shame. I currently ride a wagon wheeled full susser but started on steel framed hard tails and this absolutely flew up the hills leaving me thinking I had turned into a roadie but no I’m still an mtber and duly pointed it back downhill and yes had to pick lines a bit cleaner than normal but boy did it fly the flex of the beautifully sculpted rear triangle soaking up some of the chatter but loosing no lateral stiffness. I was in love and my mate who was on a full suspension bike was struggling to keep up with me. On return to the stand I got talking to the owner and explained that I thought the bike was amazing. It was that good that the next bike I demoed was a German full sus and it felt boring and unconnected. 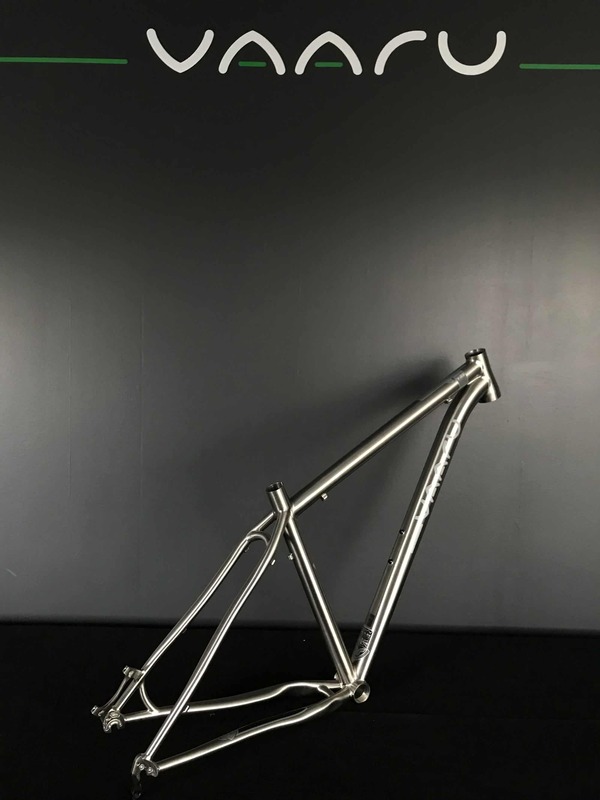 If your looking for a beautifully crafted titanium framed hard tail then look no further as this bike is awesome and the gentleman who owns the company is more than happy to help you get what you want.